A variety of B.C. river rafting companies offer a world-class whitewater experience, some right here in the Lower Mainland. Whitewater rafting is an adrenaline lover’s paradise: rushing rapids, whirlpools, high speeds and a great sense of camaraderie among paddlers. Extreme adventure hubs like New Zealand’s south island or Interlaken, Switzerland are known for their top-notch raft tours. But when it comes to rafting, B.C.’s chilly rivers offer a boatload of fun. Different sections of river are assigned different ratings which indicate how challenging it is for a boat to be paddled through. Beginners may want to stick to classes one, two or three, while more experienced paddlers can challenge themselves with class four rapids. Class I: Easy and relaxing. Slow current, small waves, no obstructions. Class II: A bit more fast-paced but still easy. Moderate waves and no obstructions. Class III: More adventurous. Lots of water-slide-like waves and eddies, rapids with clean drops. Class IV: Exhilarating! Very difficult, long rapids with powerful waves and big drops. Class VI: Don’t go there. Maximum difficulty and not worth risking your life. 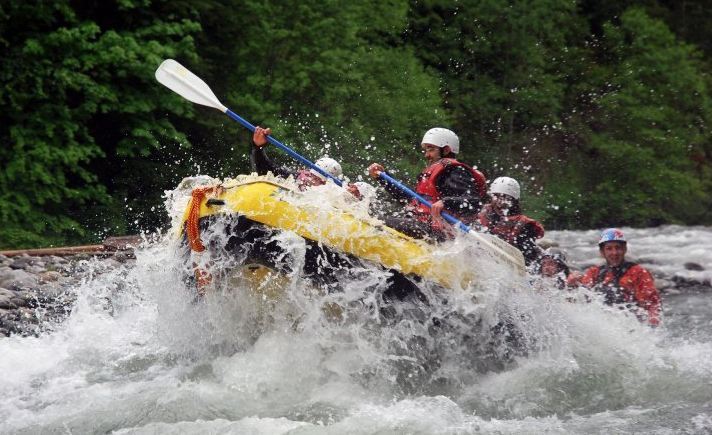 The closest whitewater rafting destination to Vancouver is the Chilliwack River, approximately a 1.5 hour drive from downtown Vancouver (depending on traffic). 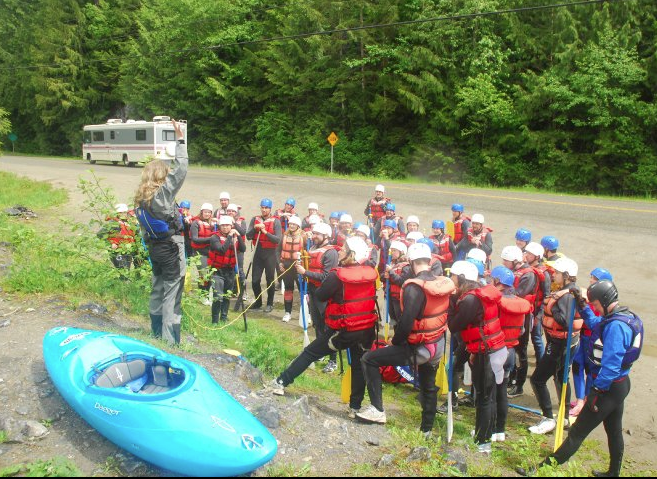 Chilliwack River Rafting offers rafting trips year-round. The most popular time of year to go is between May and September, when temperatures are warmer and days are longer. During these months, the company offers daily departures at 8:30 a.m. and 12:30 p.m.
Rafters listen to a safety lecture from an experienced guide before a trip out on the river (photo from Chilliwack River Rafting)8:30 a.m. and 12:30 p.m. The company offers two different day trips, both suitable for first-timers or more experienced rafters. 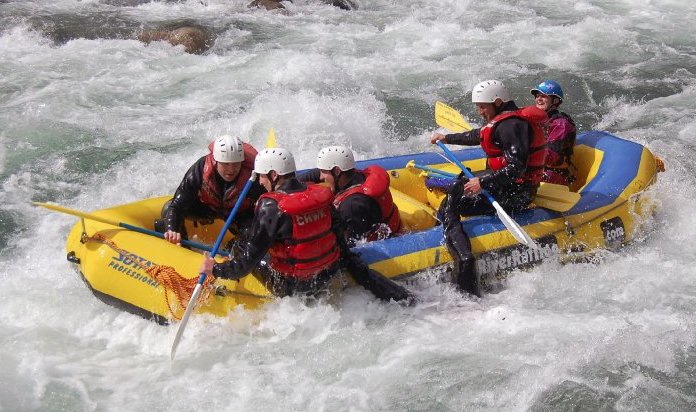 The more challenging Chilliwack River Canyon outing boasts continuous class 3 and 4+ rapids. A five-hour day trip costs $89 per person (plus tax) and includes lunch and all equipment such as paddles, life jackets and helmets. Groups of more than seven people pay only $81.50 per person, and even larger groups can save even more. Whistler-based company Rafter C3 Adventure Ranch is another option for Vancouverites looking for a whitewater adventure. C3 offers day-trips for all ages and skill levels. Beginners and families with children may enjoy the Green River Whitewater Safari ($69 per person plus tax, children half price). For more adventurous types, C3 offers the Paradise Valley River Safari, a day trip on the Cheakamus River that includes some rougher rapids. ($125 per person, children half price, lunch included). Destiny River Adventures offers day tours on the Nimpkish River, near Campbell River on Vancouver Island ($149/person). Kumsheen Rafting Resort, based in Lytton, B.C., has a pricier six-hour day trip option ($163/person) on the Thompson River. Mountain High River Adventures offers day trips on the Bull River (best in late May/early June) and the Elk River (good at any other time of the year) for $120/person. I have personally rafted the Elk River and the Chilliwack River and both experiences were excellent. I did the Elk River in September and the water was fairly low. It was a warm day and I think everyone enjoyed the lazy ride down the river, punctuated by brief bursts through the rapids. Lunch was amazing, with high-quality nutritional food that we ate at a pristine wilderness picnic spot on the river bank. llenged me like the Elk River and Nymboida River (Coffs Harbour, Australia) did not. The river is continuous rapids with no long, lazy calm spots for paddlers to catch their breath. About 10 minutes into the ride, I got bounced out of the raft and plunged into the frothy water, only to be dragged back into the boat by our fantastic guide. The river is rough and freezing cold, the guides are well-trained and funny, and the scenery is beautiful. Whitewater rafting is a great experience and some of the best rafting conditions are coming up in late May and June.